PRICES: Please visit our Rates & Reservations Page for our base rates. PACKAGES: We have many yoga retreats to choose from. Yoga & Adventure, Yoga & Surfing, Yoga & Rejuvenation, and Pure Yoga. Please see our Anamaya Retreat Packages (ARP’s) for more information. WORKSHOPS: We are excited to offer our guests three special workshops this week. The first one on alkalizing plant-based nutrition, the second on the art of self-relization, and the third on asana alignment and posture. Please see below for more information and details. as one integral part of his FitYoga movement. His asana teaching method is based on precision, core integration, energy flow, constant balance of Mind-Body-Spirit. Balazs is also a vegan activist promoting the power of ahimsa (non-violence) and daily self-reflection through prayers and meditation. He gives regular lectures on self-empowerment self-realization, plant-based nutrition, asana alignment, yoga philosophy workshops and offers regular Tibetan Singing Bowl meditation concerts. From age seven Balazs was trained to become a professional gymnast in Hungary. 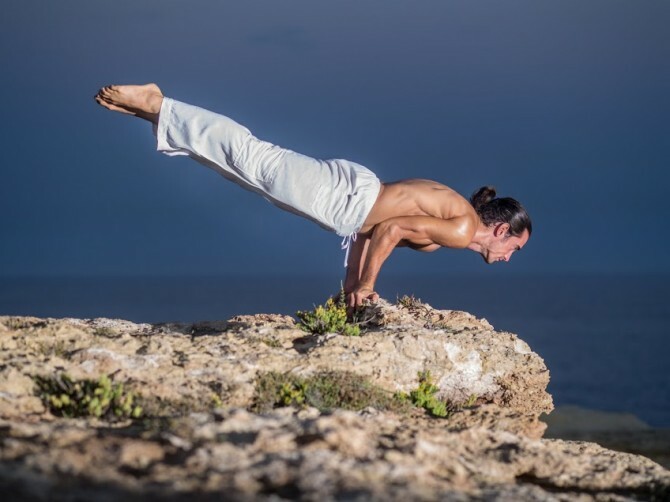 Throughout his 13 years of gymnastics career he developed in-depth body consciousness which has greatly contributed to his precise asana alignment, strength and core integration in his yoga practice. Balazs was introduced to yoga, Pilates, sport massage and physiotherapy as a healing method to tackle his gymnastics injuries. As the physical healing and the spiritual transformation aspect of yoga were so profound in Balazs’ life it became a daily practice ever since. Balazs has completed his 200-hour Power Yoga training with Fred Busch and the 500-hour therapeutic yoga training with Rae Indigo & Ruslan Kleytman. In 2009 Balazs won the European Bikram Yoga Asana Champion title and he developed his own style of yoga called FitYoga. FitYoga is a dynamic fusion of Vinyasa Flow, Hatha Yoga combined with core strengthening Pilates & fitness elements. Balazs is passionate about spreading the FitYoga philosophy on a global scale and the Anamaya Resort is going it be his first station on his American Tour in 2016. Balazs’ Philosophy is very simple: BE TRUTHFUL TO YOURSELF! The only way to reach this state of well-being is if you establish a conscious balance of Mind, Body and Spirit in your everyday life. Once this harmony is firmly established, only then we can experience true connection to our higher self (God, universe), freedom from our EGO. Happiness is not the destination but your essential being. 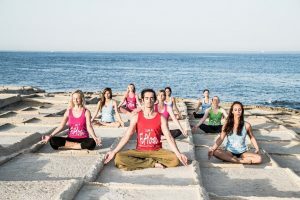 Those who participate Balazs’ FitYoga retreat will experience a beautiful inner transformation which will be a reference point for the rest of your life to support your journey of self-realization and self-actualization. The week with Balazs will definitely transform your life physically, mentally, emotionally and spiritually alike. No previous yoga experience is required but open mindedness, willingness to change and face your reality are important assets to have. The intention of this one week inner journey is to give you a reference point in your life so you can always come back to it. It’s high time you dealt with all your fears and self-limiting beliefs so you can finally live your true life. It is high time you put aside your masks and start to look deep inside of your true self. Through FitYoga and alkalizing nutrition you will detox and energize your body. Through the hands-on asana alignment workshop you learn the right technique and execution of postures, connecting the chakra system with specific asanas, and learning therapeutic Yoga and Pilates elements to strengthen your lower-back. Balazs’ 2-hours workshop will explain the key elements of alkalizing plant-based nutrition so that you have no more confusion about this subject. Here are some of the topics Balazs will cover in his thought-provoking talk: the spiritual aspects of food, the psychology & physiology of human digestion, how to deal with addictions: cravings to sugar, emotional eating, coffee, alcohol etc. the pH balance of the body: alkaline vs acidic foods, healing with raw foods, how to say no to common diseases naturally: overweight, diabetes, candida, stress etc. ; low energy vs high energy, key principles of whole-food plant-based nutrition, the power of juicing/blending. Superfoods you should eat every day, natural weight-loss/gain & stop die-ting, colon cleansing, detoxing-fasting naturally, raw food vs cooked food: the enzymes, conscious shopping: what to check?, lies/myths on healthy & sport nutrition: where do you get your protein, dairy products as a source of calcium, meat & fish, vitamins & supplementation; how to feed our children, how our body communicates with us. Fear Into Power is a 3-hour life-changing workshop split in two parts. The first part is about the Art of Self-Realization understanding who we are, how to find our true purpose in life, how our ego works, what are the most important spiritual laws which guide us to build momentum and to get out of our comfort zone to make the necessary changes, how to release stress/anxiety, communicate transparently in your relationships, what are the 5 human needs. The second part is about the Art of Self-Actualization which will give you the practical toolkit to manifest your desires/goals in your life. You will learn how to turn fear into power, how to live in a spiritual-based partnership, how to choose the right career and live with passion every day. The main intention of this workshop is to teach you how you can take action and manifest your desires, how to gain self-confidence, stability and constant growth in your everyday life. True happiness cannot be reached unless you achieve deep self-awareness and spiritual consciousness to understand where you are standing right now and what you truly want in your life to manifest. Any physical exercise without the right technique and execution causes constant stress on our physical body and eventually leads to injuries, especially when it comes to back-pains, neck-pains, shoulder, wrist, elbow, hips and knee injuries. Unfortunately, many people get injured throughout their yoga practice because there is no body-awareness, correct posture (asana) alignments, and students practice the wrong alignments over and over again until the body says ‘I had enough’. 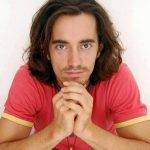 Balazs as a gymnast, massage therapist and Reiki master has a very precise understanding of the physical body what he combines with the energetic system. His asana teaching method is based on precision, core integration, energy flow, constant balance of Mind-Body-Spirit. To make his teachings practical he demonstrates his alignment principles on different asanas chosen from back-bends, forward-bends, arm-balancing poses, inversions and warriors, including some spinal and core strengthening elements to tackle back-pains. This workshop gives you the basic principles of body awareness, asana alignments and core integration so that you can practice with confidence and grow strength and flexibility without any injuries. If you want to improve your posture, strengthen your spine, enhance your yoga practice or any fitness exercise you practice, this workshop will definitely add to your body awareness!